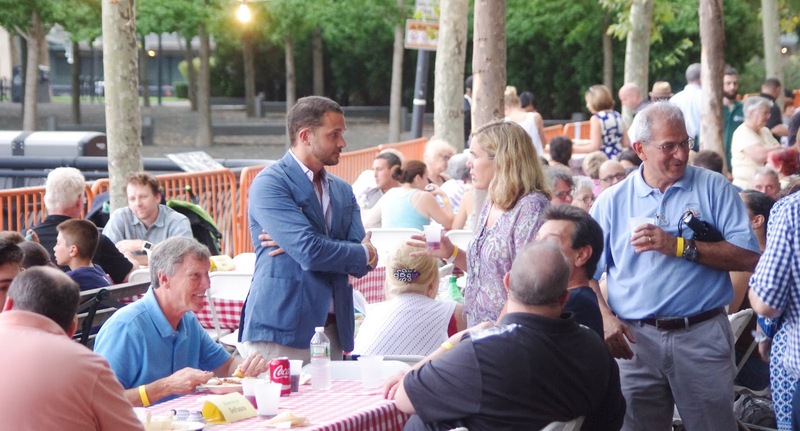 There weren't any actual miracles allowing Hoboken's annual spaghetti dinner last night but a rumor had spread after the mere twinkle of a mist soon departed. Director Leo Pellegrini was the unofficial master of ceremonies for mustering a truce on the threatening skies. At least that's the one job under environmental services he's not listed with making. 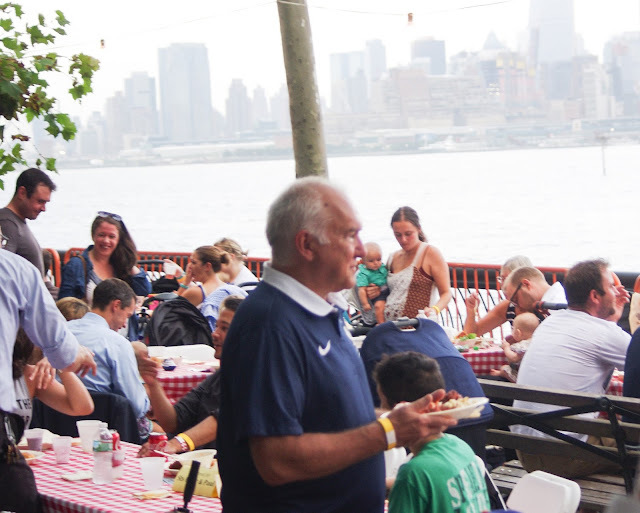 An alt-farm animal received a late invitation and gratefully attended what's become one of Hoboken's finest late summer events for the community to come and enjoy a spaghetti western dinner, semi-Italian at its premier waterfront. 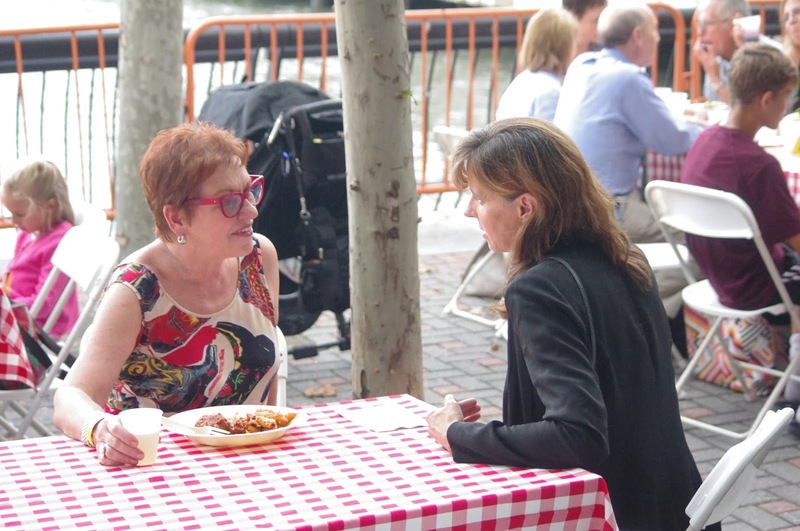 Year to year many Hoboken officials attend rubbing shoulders with residents. This year was no different although the blood rushing and heart stopping "On the Waterfront" politics has reached the lowest ebb in some years. 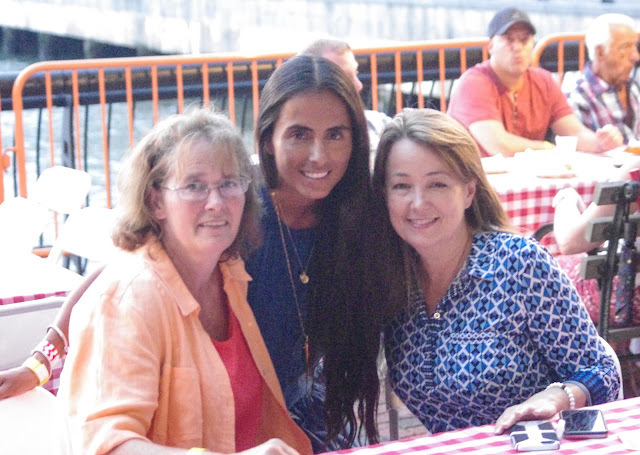 The onslaught of local political glitterati showed to mix and mingle in a casual, friendly late summer atmosphere. Random sightings included Mayor Dawn Zimmer who gushed about a vacation out to the western frontier. How does customs handle re-entry from out yonder? Mayor Dawn Zimmer made the rounds chatting with residents after returning from a family vacation. We're not clear if we overheard her say she rocked or hoofed it. This farm animal was luckily stationed at the Fisher second ward council table, a first with Councilwoman Tiffanie Fisher. She had a gaggle of her campaign team assembled from last year. 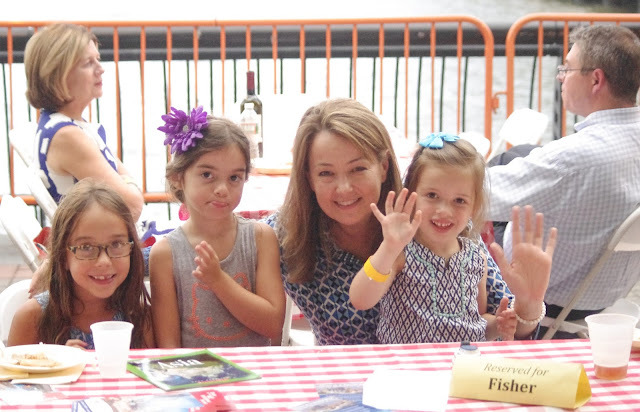 The Ms. Fisher kiddie campaign team included sister duo campaigners charged with distributing campaign signs on Washington Street and her communications coordinator with a sky blue bonnet hairpin who graciously waves at farm animals going by. Second Ward Councilwoman Tiffanie Fisher posed with a gaggle of campaign munkeez for this photo. Fifth Ward Councilman Peter Cunningham is seen rear right. First Ward Councilman Mike Defusco attended again but for the first time as an elected official. The gregarious councilman circulated at a slightly less frenetic pace than last year but the graciousness to all continues unabated. First Ward Councilman Mike DeFusco made the rounds seen here chatting it up at a table with Hoboken Housing Authority commissioner Hovie Forman. The Hoboken Board of Education is well represented at the dinner with BoE trustee Tom Kleupfel who was joined by colleagues past and present. BoE Trustee Tom Kleupfel arrived late but in time to have a plate and join the party. BoE Trustee Irene Sobolov and Reach Higher slate mate Sheillah Dallara stopped to strike a pose with Second Ward Councilwoman Tiffanie Fisher. 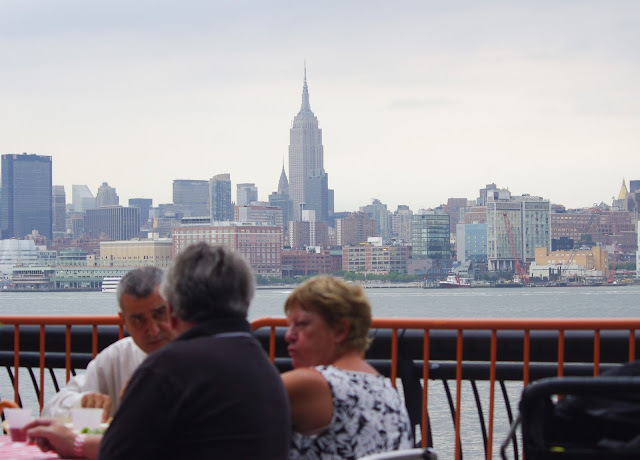 The star of the show, it's the Hoboken waterfront with the blocks long diners enjoying all the sightlines. Among other local officials, Councilman Jim Doyle was briefly seen jogging past the blocks long length of tables. Fifth Ward Councilman Peter Cunningham attended with family as did City Council President Jen Giattino who showed some of her family photos on a recent trip to Antigua. Hoboken Housing Authority Chair Dana Wefer and her husband brought along baby Josephine who while only a year old attended her second Hoboken Spaghetti dinner. Geri Fallo and others who spearheaded another great event with many others pitching in from Leah Healey to Stevens students and this Horse's old neighborhood friend Nick. They really outdid themselves as hosts to one of Hoboken's best annual events.